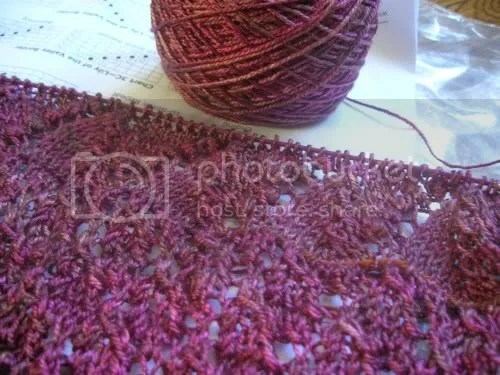 As delightful blogger Cyn so fantastically summed up in her post yesterday, “if you’re not knitting a triangular shawl right now, YOU’RE DOING IT WRONG.” Well, nyah-nyahs to me, because I am doing it right. I am knitting a triangular shawl right now, and in fact it is on the homeward stretch of being finished. What shawl, you might wonder? Well ladies and germs, it is the ubiquitous Swallowtail Shawl by Evelyn Clark. I think that just about everyone in knitting land has made this shawl. In fact, even if you haven’t made it, I think you should double-check because you may have actually made it when you weren’t looking. There are over 4,400 of these babies on Ravelry and I can see why. It is lovely. Well, that it is, it is lovely until you get to that first round of the freakin’ nupps. Increase 4 sts into 1 st? No problemo. Then on the next round, p5tog into that same stitch? Pah, no problemo….sort of. After those first 2 rows completing the first set of nupps, I was considering how I would feel tossing it out the window and letting the birds carry it off for their nests, that is how agonizing the first set of nupps was. I immediately grasped the rationale behind so many knitters’ decisions to replace those nupps with beads. But then, it got easier. The next set was better, and then the next set after that was better, and now I feel comfortable saying “I have nupped.” The thing that is worrying me now, interestingly enough, is the quantity of yarn. I still have what feels like a hefty quantity of the Handmaiden Sea Silk left (delicious, but also tres chere), and I would hate to have a huge amount of leftovers. (Mind you, I would also hate to run out. Please knitting karma, please be gentle). In any event, I should discover the answer soon enough, because I am now on to the 2nd lily-of-the-valley repeat and then have the border edges to go. And then, a 2nd triangular shawl of the season will be mine. This may end up being the ‘Summer of Shawls’ that I wanted last year to be, and wouldn’t that be exciting? i just finished this shawl for the first time as well. i’d be careful about your yarn situation. i too thought i’d have plenty leftover (i had almost 500 yds) and i ran out of yarn on the last 5 stitches of the bind-off. the border repeats definitely eat yarn. I felt the exact same way about the nupps when I made this shawl. I can’t stomach the idea of doing laceweight nupps for a very long time, I think. oh, and damn that’s a gorgeous colour!!! I know what you mean about the shawls. I’m trying to finish your Basic Black cardigan, and it just feels wrong to try on a cuddly warm sweater in this weather! Mind you I think it’s going to be a favourite sweater; it’s a lovely pattern. So I’m keeping at it so I can post a FO on Ravelry! Love that colour! When I made my swallowtail, I had to p5tog with a smaller size pointy little sock needle and then slip the stitch back to my working addi turbo, it was such a pain! But the results are worth it I think. I just don’t understand how so many people can love nupps! I keep reading blogs where people are choosing patterns specifically for the nupps and I think they’re crazy! Now I want to go and restart that shawl I tried knitting on my trip. That is the yummiest yarn!!!! I’ve done two triangular shawls so far this season. I have fallen in love with lace. I approve of this shawl-knitting behaviour. Yup. Oh, too right. I just started one yesterday. Absolutely beautiful! I’ll have to mark that as a fav on ravelry. Never seen it before! I’d be interested to try some nupps for myself!!! i just finished mine and I HEAR YOU. the shawl is beautiful, and someday I’ll look up what a “nupp” is. I’m making one as well, and actually really enjoying the nupps. I like how fast the rows go since I’m paying attention to the nupps. And it livens up the purl rows too. I tried to increase the size of my shawl (to wear to a wedding later this summer) and ran out of yarn, so I’m reknitting, but I think I’m about where you are. I love love love that colour of seasilk! So pretty! The Knitted Lace of Estonia gives a good tutorial on nupps, and honestly I can’t wait to give them a whirl – even if it drives me to tears and gnashing of teeth! I just recently finished a Swallowtail, though I have yet to block it. The color of yours is almost exactly the color of mine, except that I used Knit Picks Palette (in Huckleberry Heather). Also, the nupps aren’t so bad as long as you knit them extremely loosely when you’re increasing. Like, pull the tip of the needle up so much that it looks way too big. Cause even if it looks too big, it still might be too tight. Hahaha, I am very nearly done my second triangular shawl of the summer. Apparently it’s a conspiracy. Hang in there – the nupps become second nature after a while. Like, around the third time you knit the Swallowtail. Betcha can’t knit just one! Enjoy your summer of shawls! 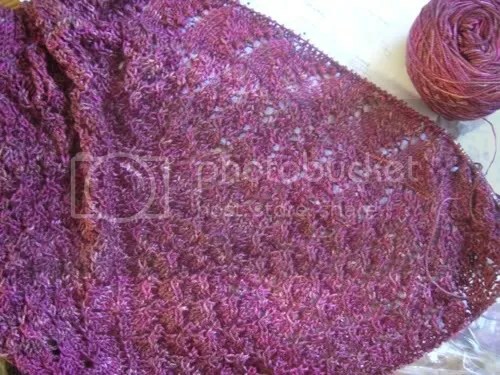 I did one in Noro in garter – it ended up being a kilometer of yarn in garter – blech! But it’s lovely and I use it every day in my refrigerator of an office. You’d love Nefertiti – just think – lace! On the Bias! My God, I’m knitting Swallowtail now as well. I plan to replace my nupps w/ bead a la Yarn Harlot. However I am not clear on he specifics – I suppose just a YO instead. Funny, I got into the in-crowd knitting a triagular shawl and had no idea.